The Home Lift Seat lowers disabled people onto the toilet and raises them back up again to their feet, doing so under power with a smooth action and utilizing a “sit-to-stand” motion. This motion is recognized as the most efficient way of getting to one’s feet as it allows the application of the body’s major muscle groups in the correct order. It mimics the rise motion of most “rise and recline” armchairs so is a familiar movement for many people. It therefore allows people to toilet independently or with reduced care while at the same time minimizing the risk of a fall, or getting stuck. Please note: The look and function of the Liftseat Bariatric model is the same as the Home model, but the Bariatric model is 5 inches (13cm) wider. Simple 2 button handheld control lowers or raises you utilizing a smooth action. A large buttoned hand control is also available for those who need it, such as people with impaired hand strength or vision problems. The Lift Seat Home models come with this seat as standard. It makes transfer easy, and is smooth with rounded edges. 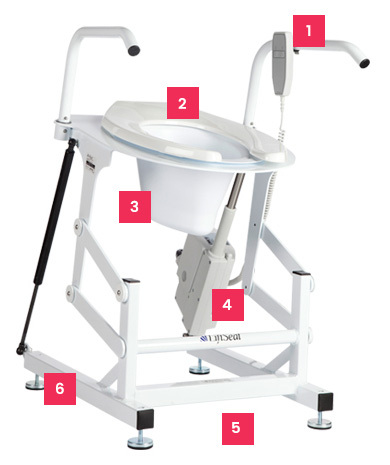 This is unique to Lift Seat, making us the world’s only powered bedside commode. For clients in their homes it means if they cannot make it to their toilet, the toilet can go to them; either bedside or in the lounge. This can be a temporary move – such as after surgery – or a permanent one. As the Lift Seat does not need ground fixing over the toilet nor anywhere else, it is quick and easy to transport and place in the required position. All Lift Seats come with 2 batteries, with one being plugged into the motor and therefore used to move the unit and a second on charge. They can then be swapped over to ensure continuity of use. Lift Seat also provides a cable for hard wiring into a fuse spur, or perhaps hard wired in to a shower toilet, such as Geberit or Clos-O-Mat. The frame of every Lift Seat has the ability to receive 4 feet – one in the corner of each frame, which act as self levelers if an uneven floor is encountered. Lift Seat also has a range of 4 heights of feet that allow clients to adjust the height of the unit to better suit their needs. It is vital that any toileting product such as the Lift Seat fits over toilets that are often placed in tiny bathrooms. Our streamlined and compact design allows the Lift Seat to fit in virtually every type of bathroom and over every type of toilet. Does the Lift Seat come supplied with everything I need? Yes. Lift Seat offers everything upon first delivery with nothing extra to pay and no extra products to buy separately. Does the Lift Seat need ground fixing? Does the Lift Seat need maintenance? Yes, but very little. It is required that the joints of the Lift Seat arms are sprayed regularly with a silicon spray to keep them lubricated. How is the Lift Seat cleaned? Use the same products to clean the Lift Seat as you use to clean your bathroom. Is the Lift Seat easy to install? Very easy. Just take it out of its box (this is a 2 person job). It will already be assembled. Remove your toilet’s seat. Insert the Lift Seat battery and then place the Lift Seat over your toilet. A full instruction manual is in every box. Will the Lift Seat fit over my toilet? The Lift Seat has been designed to fit over all toilets, including standard oval shaped ones seen in most houses and all designs including art deco, Victorian and modern. Will soil pipes, boxed pipes etc get in the way of the Lift Seat? Almost certainly not. The design of the Lift Seat means all its functions and structure are under the Lift Seat toilet seat and this avoids such structures. Will the Lift Seat fit into my small bathroom? Yes. We have designed the Lift Seat around the British bathroom, so our compact design has been well thought out.